Today, the norm is to be practiced. The shooting site is know and no pre-search with the dog is necessary. 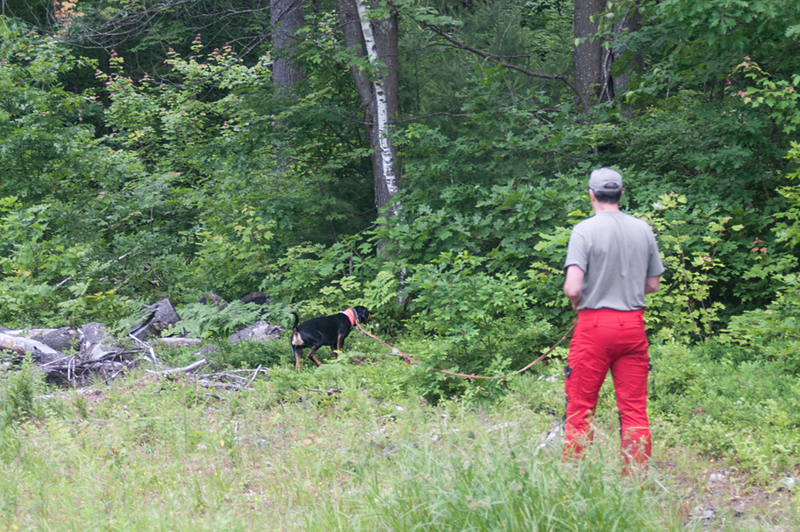 The tracker approaches along with the dog and puts the dog down nearby. I prefer, however, the dog will not lay, but to let it sit. The picture illustrates why. Often, especially in summer, the vegetation is so high that a laying dog can no longer see what is going on. After the dog has taken his place, the handler goes to the shooting site to investigate this in peace. Doing a real track, the shooting site is very important. It tells the tracker what happened and where the bullet or arrow hit the game. The dog, that will not let his handler out of sight, now has the opportunity to focus on the up coming task. By applying the tracking collar the dog usually already knows what to expect. He is understandably nervous and eager to begin the work. The concentration phase at the shooting site helps him to find the necessary rest for the following often hard work. So let yourself enough time for this ritual. 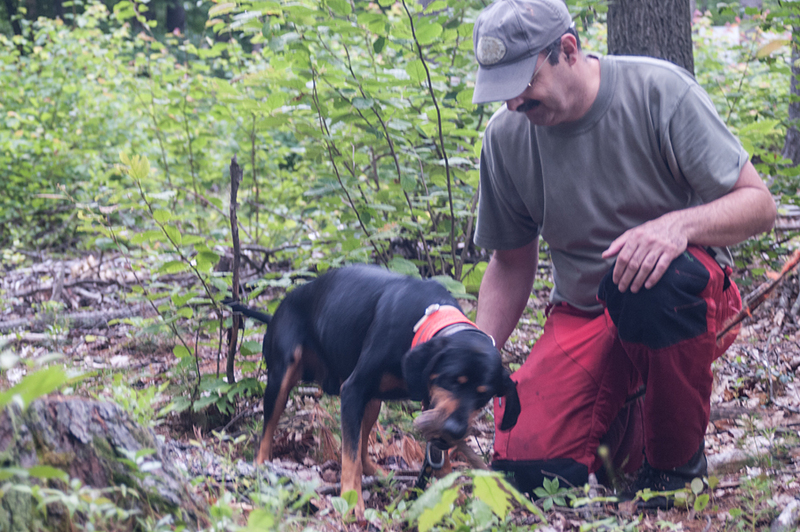 When the tracker gained sufficient clarity on the situation, he leads the dog to the shooting site. 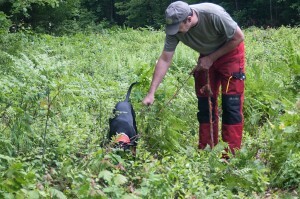 The dog will immediately begin to control the shooting site and looking for the track, that leads away from this area. This can happen very quickly, but also take some time to complete. It depends on many factors. Give the dog the time he needs. If he has found the exit, he will show you and the actual track work begins. Where the game entered the woods is always an interesting place. 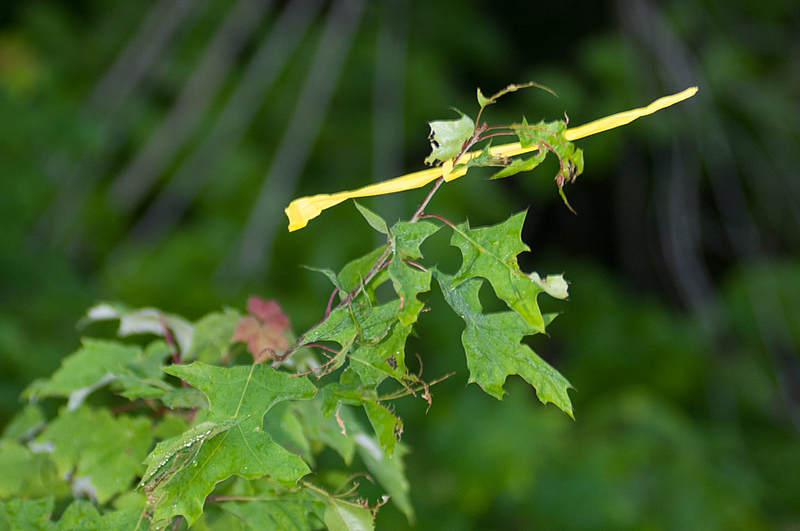 Firstly, the chance is high that the game wipes blood on leaves. The vegetation here is mostly high and tight. So pay special attention to it, even if the dog should not have shown anything​​. 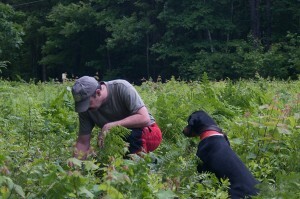 And it is also a good opportunity to determine whether the dog is on the right track or follows a healthy animal. Crossing the edge of the woods concentration is required again. Mostly the ground surface changes here. A change in surface always is a challenge for the dog. It may be that he will need some time here to make sure where the track is. Again allow your dog to have the time he needs. Because of the markings that were placed in laying the exercise track is visible at any time, whether the dog works the track or gets busy with something else. Always give your dog the time he needs to find and stay on the track. Give him one to one and a half lengths of the tracking leash. Only when he is further away from the track and you have the impression that he has lost it, call him off. Has he completely lost the track and will also not return to the track, carry him off. The dog should never be taken with the leash in the right direction or prevented by holding the leash. Such a correction of his work will have fatal consequences on a real track. More than once the leash will be caught and the dog’s conclusion will be that you are calling him back. Therefore, correct him only verbally or by carrying him off physically. The marks in the course of the track also indicate where to find the spots with hair or bones you prepared in advance. 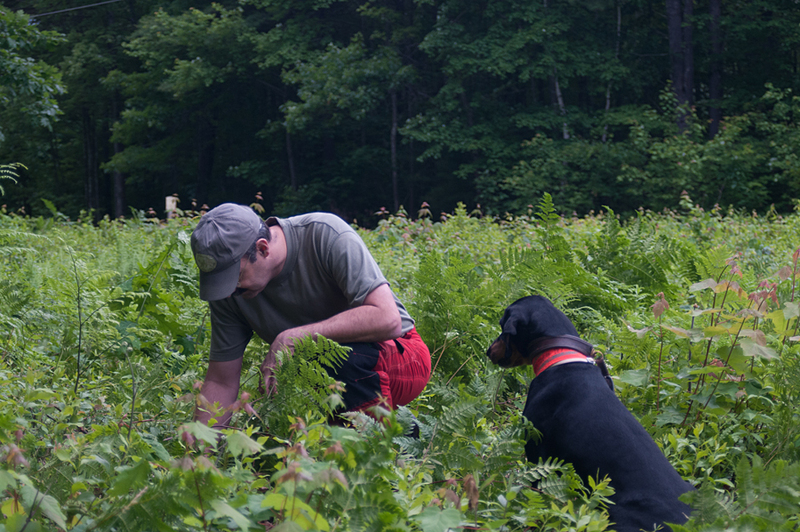 If the dog ignores these spots, let him stop on the track and examine the reference point as you examined the shooting site. This will arouse the interest of the dog and he will comes back. Show him what you found and they praise him when he gets interested. Do not go on before the dog examined the reference point. When the dog finally arrives at the end of the track and finds what you have placed there before, grap your chance to tell him what a great job he did.